Hsueh Yueh (Xue Yue) was a Paoting graduate and former Whampoa instructor who had led the Kuomintang pursuit during the Long March. He held back the Japanese advance in the mountains south of the Yangtze in 1938. Hsueh was acting commander of 9 War Area in late 1941, with a political commander over him who Chiang Kai-shek considered more politically reliable. At the time of Pearl Harbor, Hsueh had just won a major victory against the Japanese at Changsha, leading them into an ambush when they marched on the city, but he had been unable to completely destroy them in the pursuit. He was also ineffective in the defense of Kiukiang. Later Hsueh led the resistance in Hunan province to the Ichi-go offensive, but Chiang is thought to have denied him supplies because Chiang believed Hsueh was in league with southern autonomists. 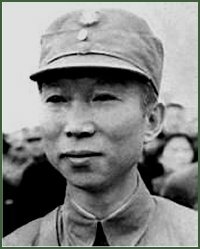 Hsueh was perhaps the best top commander in the Nationalist army; able, forceful, and critical of Chiang for not doing more against the Japanese. He was irritated by Chiang's style of military micromanagement, and claimed that he once deliberately led his troops into a remote area of Kiangsi province to ensure he was out of telephone contact with Chiang. He was an associate of Ch'en Ch'eng and T.V. Soong.